16th of October 2012, the legendary day that followed millions of smiles across the globe particularly for the tiger lovers who were disappointed due to ban on tiger tourism by Supreme Court and many individuals and groups along with government agencies filed a review petition. It was the day when SC allowed tiger tourism across 20 % of the core areas of famous national reserves of India; keeping in mind that the guidelines released by the Government should be strictly followed. And now the real thrills begin when the gates have been opened for the worldwide nature lovers who wish to throng in India for wildlife tourism. The different tiger reserves like Jim Corbett National Park or Ranthambore Tiger Reserve is receiving bulk advance bookings at its different major hotels and resorts soon after the gates were open with more and more tourists asking for different exciting packages and offerings. With festive seasons rocking the moods, the wildlife lovers want to spend their festive moments amidst the lush foliage of the dense reserves and are planning their India wildlife tour accordingly. The question of affecting the wildlife and the conservation of the species was the raising issue during all those days of banning that certainly alienated the wildlife species from the outer world; but now the moments have come when more and more people will get a chance to interact with those majestic predators. The different tour operators are coming out with interactive and promotional ideas for tiger tourism in different reserves. The latest three R’s approach namely, Recognition, Responsibility and Recovery are the basic keys of an ideal, sensible and responsible tourism across different national parks. However, if the government and the tourism stakeholders work together, it will bring the perfect craft solutions to benefit the local communities, nature lovers, tour operators and most importantly the wildlife itself. India, the land of royal Bengal tigers proudly maintains the Project Tiger since 1972 and many different tiger reserves have been established for the same. 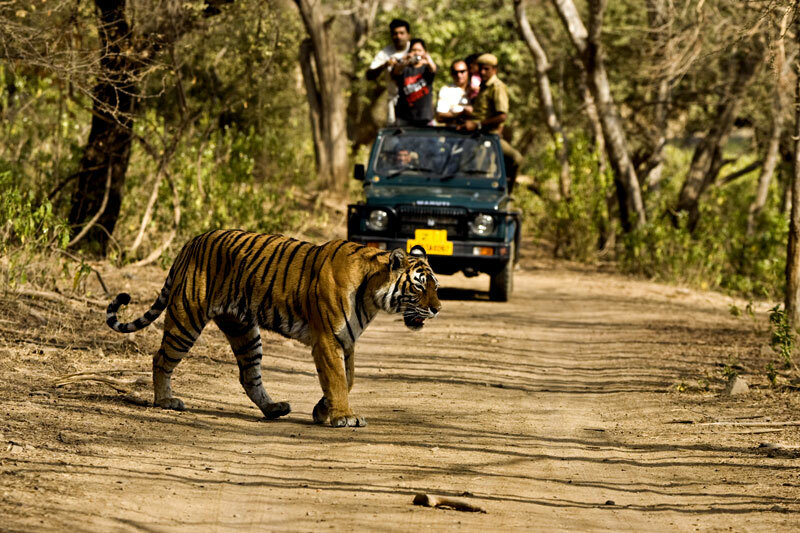 The Ranthambore Tiger Reserve is definitely named for the famous and celebrity tigers where the tigers are specifically identified and called by their unique names given by the locals and the tiger lovers. The widest and the largest reserve, Ranthambore National Park is the real pride of India where the tourists can have the best options of staying at the Tiger Den Resort, Sherbagh and Tiger Moon Resort. On the other hand, the northern India (in Nainital, Uttarakhand) proudly highlights the first and the oldest national park of India the Jim Corbett Tiger Reserve that initiated the Project Tiger in India and encouraged the people about the wildlife conservation. The most impressive part of Corbett Reserve is its highly popular and attractive luxury resorts where mere names are enough for tremendous amounts of booking. The Corbett Leela Villas, the Infinity Resort and the Dhikala Lodge are some of the best names for different categories of residing options in Corbett. Moreover, Assam’s Kaziranga Reserve which was closed in heavy flood and loss of lives is again welcoming the tourists for Rhino visit and opened its door on 1st of November. The land of Barasingha (Swamp Deer) and tigers in Balaghat, the Kanha National Park and Bandhavgarh in Umaria district in Madhya Pradesh too opened their gates in 20th October for majestic tiger tourism. These major reserves in India have one and only common feature and that is the presence of tremendous amounts of wild species and Avian living comfortably in their natural habitats that chiefly captivate thousands of tourists every year. Thus, the major decision of uplifting the interim ban on tiger tourism by SC has really come out with positive results on India wildlife tourism. All these national reserves which are now open for tiger tourism are today filled with many tourists and nature lovers. In addition to this, the different tour operators are still drawing more and more people with their attractive offerings on different occasions which are resulting into a revolutionary rush for advanced bookings.